The Empty Stocking Fund benefits three cooperating agencies, Bradfield Community Center, Mizpah Community Center and the Salvation Army. Money can be donated by sending it to The Lima News, 3515 Elida Road, Lima Ohio 45807, or by dropping it off at any Superior Credit Union branch. 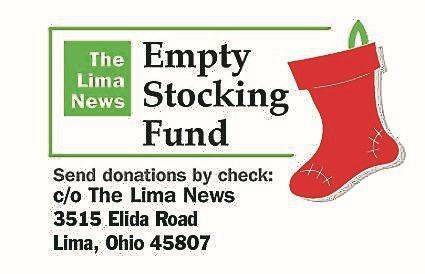 Donations of new toys and nonperishable food items will be accepted at The Lima News office. These stories use assumed names to protect the participants’ privacy. See past stories at LimaOhio.com/tag/emptystocking. LIMA — George and Georgia never expected to open their home to five children, but that is exactly what they felt they had to do after receiving a call on Jan. 23. At 1:30 a.m. Jan. 23, George said he was notified that his five grandchildren would go into foster care due to a domestic violence incident between his son and his son’s wife. Although George’s only income is disability and his wife works in retail, they could not fathom knowing their grandchildren would be separated, so they decided to take them in. However, George admits taking care of the kids has not been easy. In August the family was evicted from their home, even after he said the landlord gave permission for the kids to live there. With no other resources, the couple decided to sell their camper and used it for the deposit and first month’s rent for their new home. The new home is ideal for the family because it has four bedrooms and is in the same school district as the one the kids were in before. However, the family has found it difficult to get acclimated to a new schedule. At 4 a.m. Georgia wakes up, takes the oldest two kids to the bus stop, goes to work at 7 a.m., comes home at 4:30 p.m., makes supper at 5:30 p.m., helps with homework and goes to bed at 9:30 p.m. She admits her routine can be very exhausting at times. Two other major challenges are buying food all the kids enjoy and having enough money for clothing and shoes for the kids. Although they get a check from Child and Family Services, George said it is not enough. The children are in need of shoes and their sizes are 2 boys, 3 boys, 5 1/2 girls, 7 1/2 girls and 8 mens. The kids would also like Lego. Although it has been a challenging year for George and Georgia, they believe it was well worth it.